Billy Munnelly is the champion of good everyday wine. And good times in Europe. 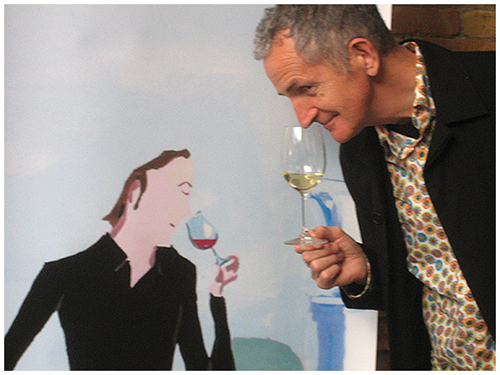 One of Canada’s most creative wine writers, Billy Munnelly has delivered irreverent, lighthearted and enlightening wine advice for 35 years. Munnelly’s mission has been to remove confusion and intimidation from the wine selection process – taking it back from the snobs. Before devoting his life to the pursuit of good, affordable wine, the Irish-born bon vivant spent years in the restaurant industry. 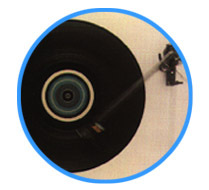 In 1977 he co-opened Stratford’s Rundles restaurant, and in 1981 opened the Rosedale Diner in Toronto. In 1983 Billy switched to drinking full time and ‘hasn’t missed a days work since’. 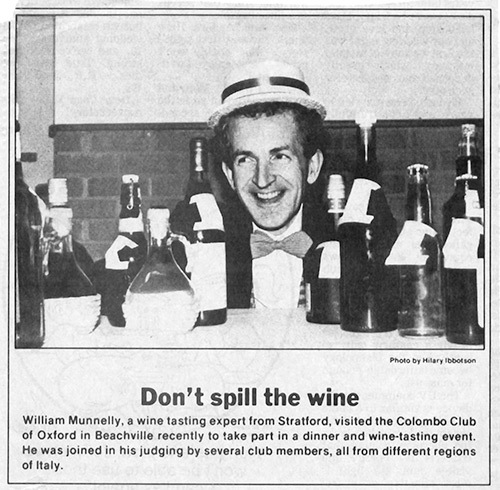 Munnelly was one of the first to write and publish a wine consumer report – his bi-monthly Billy’s Best Bottles Wineletter (1983 – 2005) was Canada’s most widely circulated wine report, with subscribers from coast to coast. In the early ’90s, Billy launched his annual wine buying guide, ‘Billy’s Best Bottles Wines’, which was a Canadian best seller for 22 years. Billy writing has been showcased in newspapers and publications including The New York Times, Canadian Consumer Report, Wine X, Toro, Wine Fox, Wish, Metro, Watershed and LCBO’s Food & Drink magazines. He is a member of the Wine Writer’s Circle of Canada, and in 2011 he received a Lifetime Achievement Award for his efforts in promoting Ontario wine. In addition to writing and publishing, Billy and partner Kato Wake, service the wine and hospitality industry via alternative wine education ‘Wine By Mood ‘, and innovative marketing concepts. For the past six years they have conducted ‘sold out’ small tour groups to Europe – with a focus on Wine, Food, Culture and Fun. Billy and Kato live in beautiful Prince Edward County, Ontario. While most wine publications celebrate the high and mighty wine world, my focus is on the middle ground, the good everyday trooper, the Toyota. Wines to get me through the week and to take me on the occasional trip. Wines to have fun with rather than worship. Not everyone wants wine expertise. Most of us just want to know which wine will partner well with life’s various events; the BBQ, the birthday bash, the pizza night. We want to know how different styles of wine might connect to our times, moods and events. We want quick, easy solutions so we can get on with enjoying ourselves. The ‘experts’ are wrong – it’s not about flavours. It’s not the details of the wine that matters, but the ‘experience’ of it. What it brings to the moment. We play music for the pleasure the feeling gives us, not for the compositions, or instruments – and so it is with wine. Experts focus on flavours in wine, but this a mistake – they should be telling us about the experience – what emotions are created by the different wines? The communion between people and wine is feeling. It’s an emotional experience. The essence or character of a wine can only be felt – it’s the feeling that connects wine to our moods and events. When you shift to seeing wine as a feeling experience you’ll become more comfortable with the subject because you know and trust your feelings. Feeling is more reliable than thought – it is the language of the soul, not the head. In North America, we’re obsessed with stardom and prestige brands and this blinds us to the whole point of wine. The Japanese tea ceremony suffered a similar fate when it fell into the hands of wealthy merchants who had little knowledge of the true spirit of the event, and made the ceremony a show of glitz and materialism. Wine’s origin is in the simple cafe or at a wooden table in the shade. It’s about sociability first and foremost. For me, wine and music play similar roles in life. They both offer an endless variety of opportunities for a lift, a laugh, or to generally delight the heart and soul. For both wine and music, the key to enjoyment is developing a sense of what’s appropriate; a knack for choosing the wine or music that’s right for the moment. Something that hits the spot. One minute we may desire something nourishing and soothing. Another time we want to kick up our heels and go wild. Forget expertise and work on your playing skills. The person who knows which wine to play is the real wine expert. Read more about my Wine by Mood philosophy here.